Last Saturday, a miracle happened before my eyes. 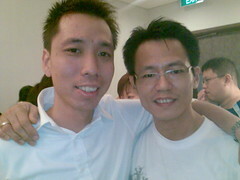 My friend, Thomas received Jesus as His Lord and Saviour. Thomas used to be my “big brother” during our days in da gang. So you can imagine my mix feelings of unbelief (in a surreal manner) and joy when he said the sinner’s prayer! Ha ha…. His salvation is indeed a testimony of God’s unwavering love for each one of us especially those who are considered a lost cause by people’s standard. Thankfully God’s standard is always higher than us, man’s. And did I mention that I had been waiting for this day for the past 8 years?! Wow… Am I bowled over by the love of God! Thank God for being merciful in saving him from a world of darkness into His marvelous light! WOW, thank God, glory, hallelujah! Jesus really is the Saviour… wow… thank God… it’s such a joy, a wonder, to see how God’s love is so incredibly rich in mercy and grace!!! PTL! God is good even when we do not “see”. It is wonderful that you saw this miracle. I hope that your eyes are open to all of the miricles that surround you.